Packing a suitcase is a process. The movies depict packing as a frantic, last-minute activity where the traveler or spouse who’s being kicked out or the runaway empties a drawer into a suitcase. 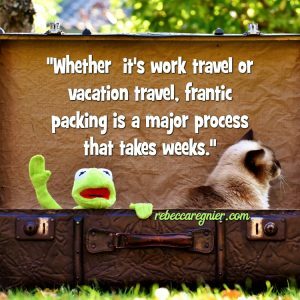 However, this is real life, whether it’s work travel or vacation travel, frantic packing is a major process that takes weeks. Enjoy these tips from an experienced suitcase packer. To begin, I launder every item of clothing I own. I have two reasons: One, even if I’m going to Florida, it might snow, so all the scarves need washing. Two, if someone breaks into my closet while I’m gone, I want them to think I’m tidy. It’s super important that I make a good impression on burglars bent on stealing my 7-year-old Target brand yoga pants.